When you order your Portable Aluminum Bleachers from Sightlines Bleachers, you get the very best in portability, ease in setup, safety, and durability in one package. We cater to a wide range of client from around the country who need portable indoor bleachers, portable outdoor bleachers, and other smaller portable bleachers on wheels. 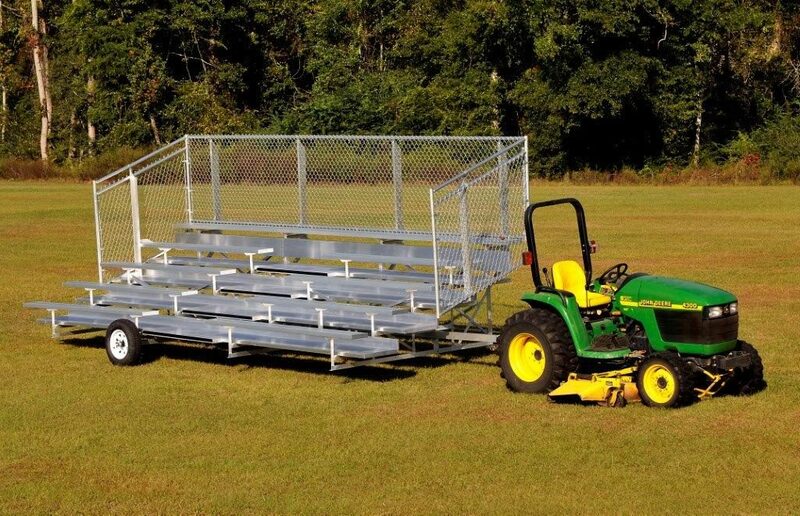 Here’s what you need to know about our Portable Bleachers. • Sightlines Bleachers DLW portable bleacher models are durable and lightweight. • Choose from Sightlines Bleachers elevated, non-elevated, transportable, tip-n-roll, low-rise and ADA accessible portable bleachers. Don’t see what you need? Ask us for a custom bleacher quote. No job is to big or too small for us. • All of Sightlines Bleachers portable bleacher models are engineered to meet the toughest codes. Don’t get caught up in cheap pricing, choose a bleacher that meets all of your local codes. • All of Sightlines Bleachers portable bleacher models that rise above 30” will have double mill finish footboards, mill finish riser boards, aisle ways with contrasting nose markers and handrails, guardrail systems to meet code, 2×10 anodized aluminum seat plank and ADA compliance when requested. • Sightlines Bleachers is a resource. Our experts have decades of experience and can answer all of your questions about your portable bleacher needs. • Sightlines Bleachers low rise portable bleachers are designed to meet current code without the need for guardrails. If you want a portable bleacher 3 or 4 rows high with a standard rise and run, we can do that too! • All of Sightlines Bleachers portable bleacher planking is 1-3/4” thick instead of our competition’s standard 1-1/2”. What does this mean? Our plank has a higher loading capacity than our competition who uses a smaller plank size. • All of Sightlines Bleachers portable bleacher understructure frames are built with a minimum 2” x 2” aluminum angle vertical pieces. Most of our portable bleachers can be upgraded to a TSA version which includes a 2”x2” minimum square tube. • Sightlines Bleachers contrasting nose markers for aisles are made of black anodized aluminum and fastens into our exclusive aisle filler treads unlike our competition who like to use stickers or external rivet fasteners. • Sightlines Bleachers has endless capability when it comes to portable bleachers. It is all we do, not a sideline. We are the experts! Sightlines Bleachers offers the widest selection of Portable Bleachers, all built according to IBC code. Contact us today at 1-800-609-1545 to place an order or learn more about our products and services.